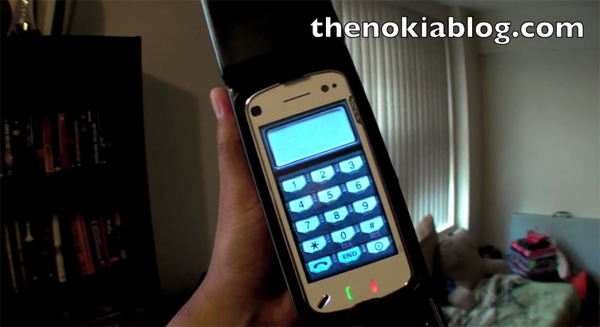 Americans probably associate Motorola-style brick phones with... well, Motorola, but Nokia had an equally vogue model way back in 1987: the Mobira Cityman. Like the N97, the Cityman was a dark gray beast from another era that combined the industrial design of a Mack truck with the user interface ergonomics of a PDP-11 -- but on the plus side, it made a terrific weapon in a pinch. It seems only fitting, then, that the two models would be united in holy matrimony through a wacky gag accessory for the N97 sent to The Nokia Blog from Nokia's WOM World, allegedly said to have antitheft properties by making your brand new Nseries look like a giant version of its great-great-great-great-great-grandfather. Ironically, an actual Mobira Cityman is probably worth more as a collectible in 2009 than an N97 is, so the effect might be quite the opposite of Nokia's intent -- but yes, of course we want one anyway. Follow the break for video of the Cityman not being stolen. Nokia N97 Cityman disguise knocks N97 back a good two or three years technologically originally appeared on Engadget Mobile on Thu, 06 Aug 2009 13:22:00 EST. Please see our terms for use of feeds.